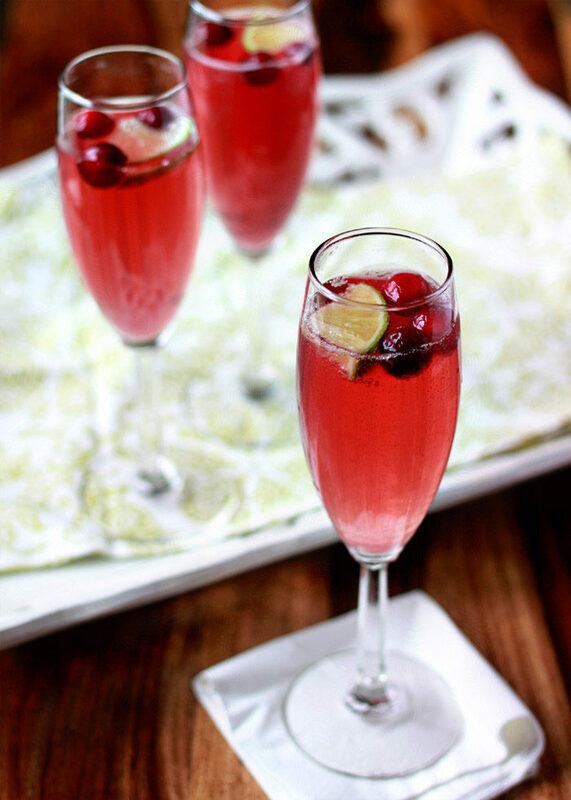 This super-simple champagne cocktail with tangy cranberry, zingy lime, and sparkling wine adds a delicious – and festive – touch to the holidays. 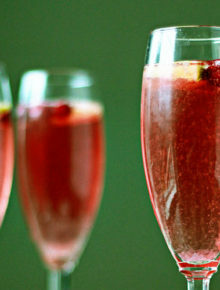 I first shared this simple Christmas champagne cocktail recipe in 2009, and I thought it was high time to revisit the deliciousness. Cheers! I have a new and vivid fascination with champagne cocktails. 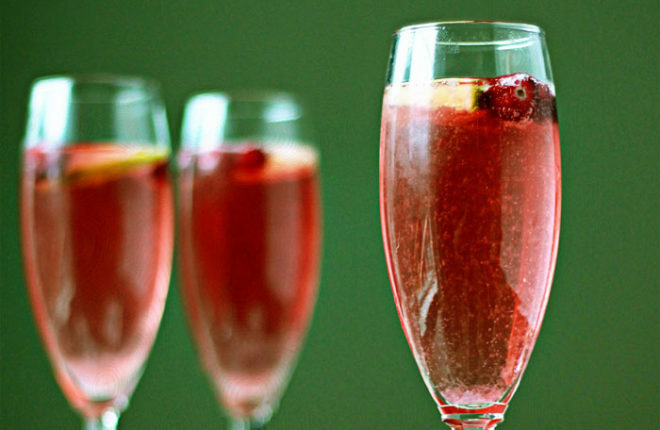 An elegant champagne flute, some bubbly, a little flavoring, maybe a touch of fruit, and you’ve got perfect party fare. And endless possibilities. I’ve yet to try the most classic iteration, with bitters and a sugar cube, but you can bet your strawberry I’ll be trying it soon. Once I figure out what bitters are. 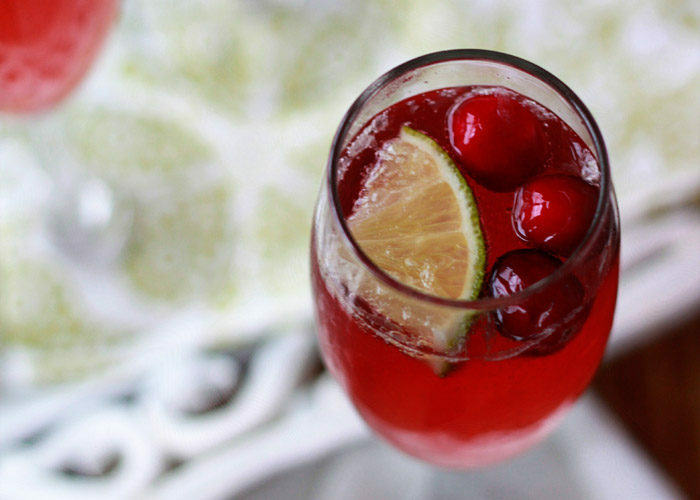 Meanwhile, I’ve got a cranberry lime champagne cocktail for you. Red and green for Christmas Eve! So perfect I can hardly stand it. Oh, totally unrelated, speaking of hardly being able to stand something, you’ve got to check out these Candy Cane Christmas Tree Cupcakes over on Bakerella’s blog. So cute I’m pretty sure I just plain can’t stand it. Okay, okay, tear yourself away from Bakerella’s fabulous blog and come back to me, will you? We’ve got some drinking to do! 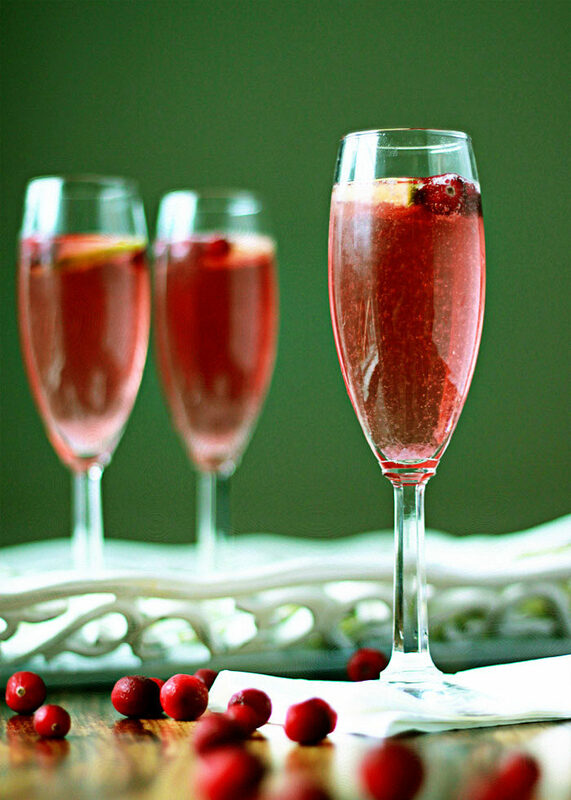 Divide cranberry juice and lime juice between champagne flutes. Fill with champagne (about 1/2 cup each). Float the cranberries and the thin lime slice on top. Serve. First published December 24, 2009. Updated and republished December 13, 2016. In Canada we can buy bitters (The bottle is about the size of a Tabasco sauce bottle.) at the market in the soda – pop section. We can also buy it where-ever alcohol is sold. Hello- this sounds perfect for a Christmas party I’m going to this weekend (12/2) and I’m hoping you could help; I’d like to make a big batch of it- like in a punch bowl maybe- if I used a whole bottle of prosecco, how much juice would you suggest? Also- is there anything special you do w the cranberries before you freeze them? Could I substitute with raspberries?